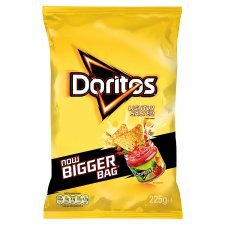 We will keep this as simple as Doritos have with their bag design. Each bag is flavor color coded. There is a large logo. There are a couple of Chips on the front. That is it. It looks modern, but is as uninspiring as any design on the market. The example on the left is a short lived promotional example. This is quite amazing considering how many of these bags sell each and every day. Tortilla Chips provide a completely different style of crunch to Potato Chips and Crisps. The initial couple of bites are firm, rigid and hard. The middle munch period features a gradual decline. There is no real mush stage. These are the ultimate example of a standard Tortilla Chip. If you were to imagine what a plain looking Corn Chip, resplendent of little black dots and bumpy oil boils on neat little triangles - this is the most accurate picture you could conjure. A Nose Plunge Test revealed a steady Corn Chip aroma. The taste is of plain, home-cooked restaurant style Chips that are made for dipping before the main event. And that's partly the point of these Chips: They need Dip to add flavour and purpose.